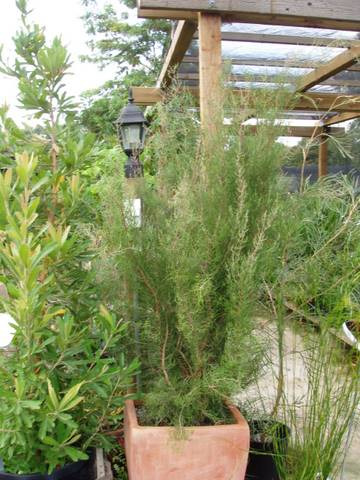 Medium erect shrub 3-6' with small scale-like green leaves and twisted branches. Terminal cream-yellow flowers appear in spring/summer. Tolerant of well-drained soils full sun or partial shade, moderate frosts, & temporary waterlogging. Grows in shallow sandy soils with a clay subsoil. Plants respond to pruning and it is grown as a "conifer look-a-like" low hedge or screen. Grown commercially for cut foliage.